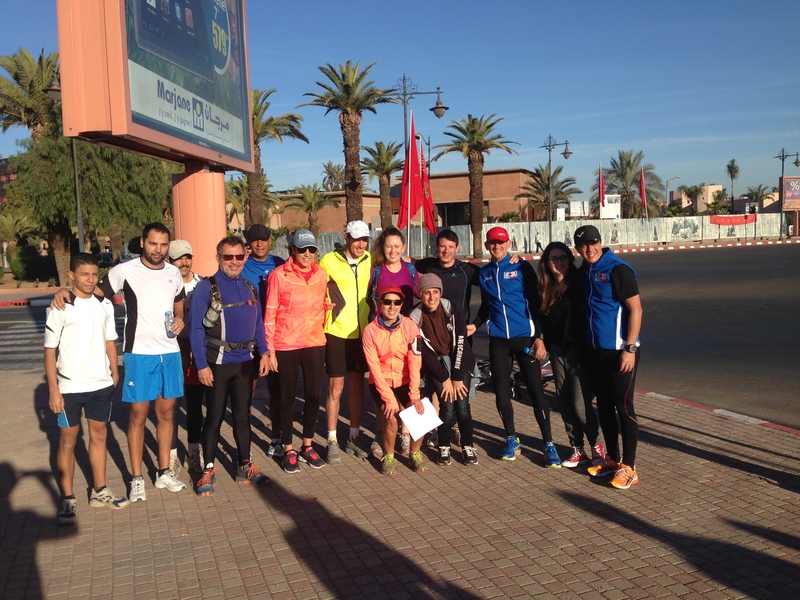 Courir le Maroc – Running Morocco! 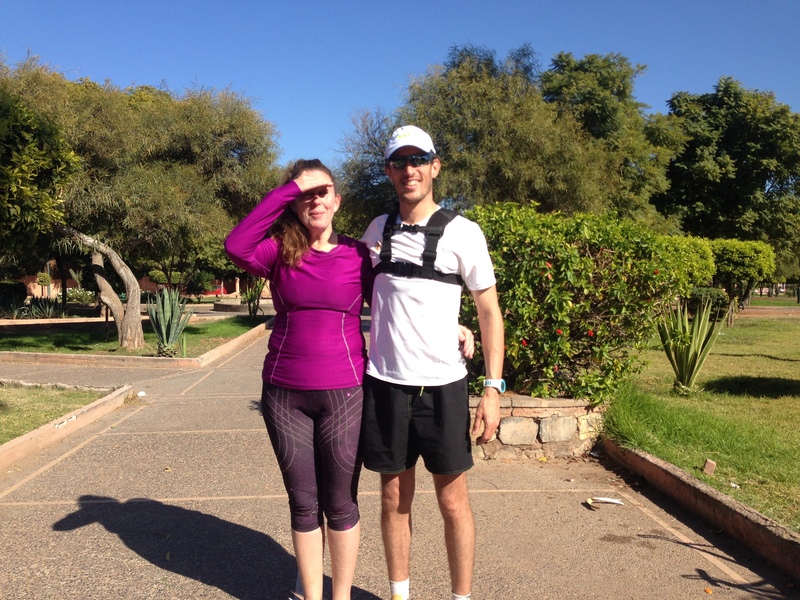 I didn’t expect to be running a half marathon round Marrakech just three days after getting here to train for the Marathon Des Sables but what a great way to spend a Sunday morning! Amine (in the dark blue) met me yesterday and very kindly took me under his wing. He is a VETERAN of MdS with 11 under his belt already and is a mine of information. As well as showing me all his kit and photos from his decade+ of MdS runs, he invited me to join him and a group of runners for a half marathon the next day and to make it even more appealing there was a pasta party the night before. At 9 am, we assembled outside the Mamounia Hotel and off we set. I was nervous because I know how slow I am and also I was using my Innovate back pack for the first time and had filled it with about 8 kg of stuff as part of my training. I had also forgotten a few pretty crucial items – sunglasses and a hat! Ho hum. Preparation is clearly not my strong point. My biggest worry was either slowing everyone down, or getting left behind and horribly lost. We had a route map but because I don’t really know Marrakesh, it didn’t mean very much to me. Needless to say, both fears were groundless. 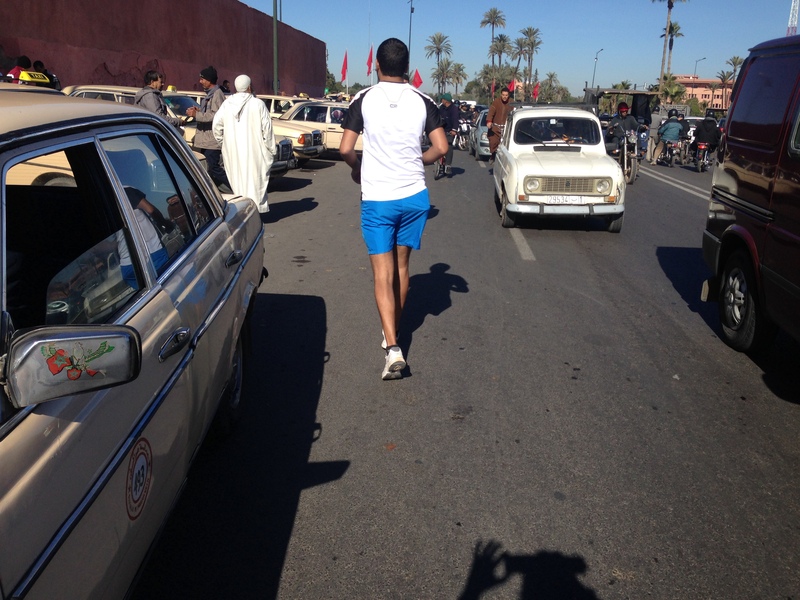 With endless generosity, Yassine stayed with me the whole way, adapting to my tortoise pace with grace and good humour. He did almost make me sick at one point though with a graphic description of how the ligaments in his knee had almost been severed in a serious car crash. The backpack was always going to be uncomfortable but it was great to try it as I now know that it is not the right one for MdS – it bounced around too much and needs more straps to keep it in place. It will be perfect for the mountains though, so nothing is lost and Amine has kindly offered to lend me one of his extensive range. The route looped us through the city, with views of the mountains in the distance and some pretty passages through gardens and palm-flanked streets. It all got a bit crazy round Bab Doukalla, jostling for position with taxis, donkeys, scooters, and bikes. The last few kms, my legs felt really heavy and my eyes were streaming from the car fumes. I didn’t realise quite how spoiled I had become with the pure air of The Peak – time to toughen up! The good thing about suffering at the moment though is I just think, “Great, remember it is going to be a million times worse on MdS. At the finish, there were oranges, a yoga session and lots of mutual congratulation. The icing on the cake was that I won a Garmin 110! The girls in the group drew straws for it, and I came up lucky. 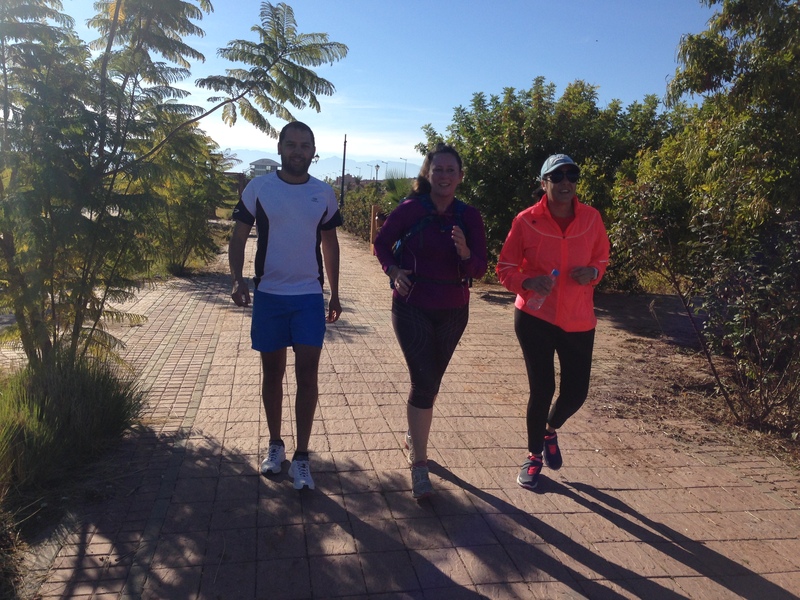 It was a really wonderful morning out: great run, fantastic company and some lessons learnt.